At only 21 years old, Gia Woods is breaking stereotypes and building bridges. 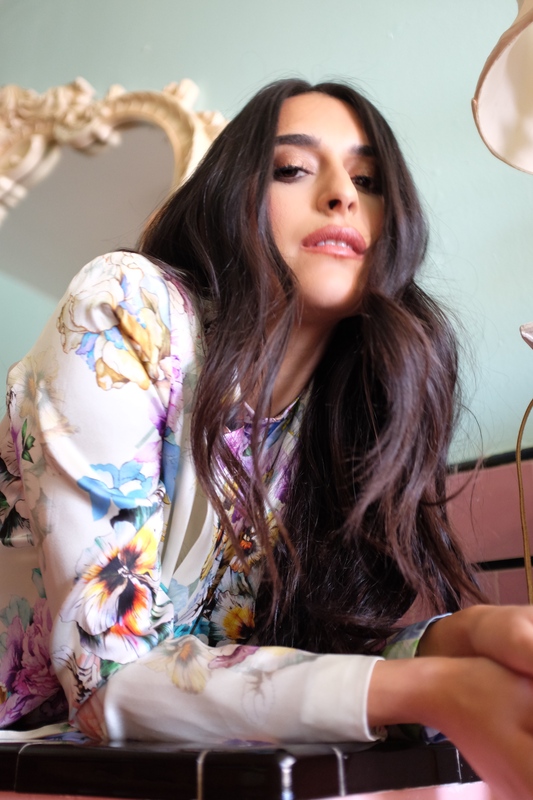 Her traditional Persian upbringing is an unlikely combination with her passion for music, but growing up Woods was adamant about teaching herself an assortment of instruments and faithfully fangirling over artists like Madonna and Radiohead. After choosing the moniker Gia Woods and making headlines with her breakout single, “Only A Girl”, Woods performed her first-ever show at LA Pride. The queer artist advocates for self-love and acceptance, a message very clear in her music. I sat down with Gia Woods to talk about her latest single, “New Girlfriend”, and the waves she’s making in the music world. Ariel Zedric: Could you talk a little about the inspiration behind your single, “New Girlfriend”? Gia Woods: “New Girlfriend” is about having risky desires and sometimes falling for a person that you wouldn’t expect. I feel like everyone has these desires that they probably wouldn’t share out loud. What was it like filming the music video? What was your favourite part? I never thought hanging out in an empty white studio could be so much fun! I had such a blast with the cast and crew. I got to hand pick all the models which was really cool, and even had a close friend be a part of it since I’ve known since elementary school haha! My favourite part was when we all were in the middle dancing and kicking and doing random poses, and just having fun with it. It’s one of my favourite videos I’ve done yet! How is “New Girlfriend” different from your previous tracks? How is it the same? I think “New Girlfriend” definitely has more of a dance feel compared to the previous releases. But I think all the songs complement each other because I have so many sides and such versatile musical taste, so I’m all about mixing different sounds and trying new things. When did you start creating music? Has your childhood or upbringing influenced your style or music affinity? It really all started when I taught myself how to play the guitar. After that, I wanted to learn everything! From piano to violin and then singing-wise, I was in choir all throughout middle school and high school. I think a lot of my musical inspiration came from my older sister, she was always playing all types of music from Green Day to Björk to Madonna, so I was really mesmerized by all types of genres. And growing up, I didn’t have a lot of friends so most of my time was spent writing music in my bedroom. How, if at all, has your musical style changed since when you first began? It’s changed dramatically! I always loved writing and playing the guitar so when I started working with producers, it was definitely a challenge at first because it took me some time to figure out what kind of production I envisioned the music having! So that was really interesting but definitely much-needed because it allowed me to experiment! Madonna. Hands down! She’s so inspiring. I was always so fascinated by her when I was younger! My sister would play her music non-stop, and I’ll never forget seeing her “Like A Prayer” music video. I would watch it on repeat! I’d be lying if I said no! I think choosing music as your full focus is a lot of time and dedication. Nothing happens overnight. I think sometimes people have this fantasy that if you put out a good song that it’ll just blow up. While sometimes that’s the case, a majority of other times it’s not and there are a lot of other factors that you don’t really have control over. What kept me going is knowing that I wouldn’t be truly happy doing anything else. There’s no plan B, this is it! I think it’s all the above. I have songs that I feel like can make you feel empowered, carefree, or even bitter-sweet. So it really just depends on the song but I want people to feel connected, and hopefully take something from it that relates to their own life or situation. Maybe something in tech haha! I’m really good at fixing things. All my friends come to me when they have problems. Signing my first record deal with Disruptor Records. I feel beyond grateful to be supported by hardworking and successful people. Being comfortable in front of the camera! Growing up I never thought about that aspect of it. I just wrote music because that’s all I knew and loved working on, but when you really start pursuing music you realize there’s a lot more to it. If you think about it for videos, you have to act and for photo shoots, it’s like modelling. But in a way, I’m happy that it all challenged me because that’s helped me grow as a person. Write every single day and put out music that you would personally be a fan of. I’m super grateful for anyone who has taken the time to listen to my music, watched a video, and to whoever is reading this! Love you all and appreciate you so much! Follow Gia Woods on Instagram, Facebook, Twitter, and YouTube, and be sure to listen to her singles “Jump The Fence” and “New Girlfriend”.